Well two actually. One needs rebuilding completely and the other could do with a new roof and some double glazing with window locks. I’m not religious but like visiting old Churches. Such fine craftsmanship, beautiful stained glass and all those pompous monuments to dead people from rich families. They don’t make me ponder on the meaning of life; they make me ponder on how much people really “believed” in God back then. It’s easy to think of England as being a country that took religion seriously hundreds of years ago but I guess most ordinary people didn’t really give a toss. They had no choice but to go to Church. Big trouble if they didn’t and even bigger trouble if they deviated from worshipping exactly what the state prescribed. 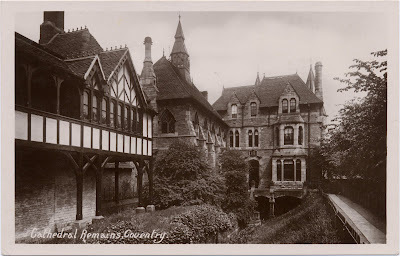 In Christian terms, Coventry seems to have started off as a good Catholic settlement with the “Holy Virgin” Saint Osburga establishing a Nunnery. After this was wrecked Lady Godiva helped established St. Mary’s Priory - the first Cathedral. This is the one that even Sarah Beeny would struggle to overhaul. Just a few traces of its foundations remain which fail to give any true indication of how big it once was. So, the Catholic vibe appears to be strong with a big Corpus Christi procession, the famous “Mystery Plays” and a number of monasteries. Then King Henry VIII decides he needs a divorce and some more money for his coffers. A good way of achieving both is take control away from the Pope so he replaces the Roman Catholic Church with the Church of England. Gets divorced, gets his hands on money that used to go to Rome, “dissolves” the monasteries and sells the land off ( or parcels it out to his friends and people he owes money to ) to make more dough. Bad news for Coventry. St. Mary’s is laid waste and the merry monks see their homes all but destroyed. The Church of England is still essentially Roman Catholic in its doctrines but others are working to change this. And others still are introducing their own beliefs, such as the Lollards. They - shock horror! - have Bibles written in English, preach the gospels in English and teach their children the Lord’s Prayer in, yes, you’ve guessed it, English. What’s so odd about that you may well ask? Well, back then, all the religious stuff was done in Latin, which very few of the ‘peasantry’ could understand. Cynics among you may suggest that this was to keep them in ignorance so that they couldn’t question the contents of the ‘good book’ and make their own minds up if they wished to believe it or not. And you are probably correct to assume this. Anyway, Lollardy becomes popular in the City and has to be ‘dealt’ with so a load of them are rounded up and told to renounce their ‘heresy’ or die. A dozen or so choose to die. King Henry VIII and later Queen Mary (Bloody Mary) duly oblige and have them burned alive at the stake. What a way to go! They weren’t all from Coventry. Seems that the state thought burning non-Coventry Lollards in the City would send a powerful message to those that were quite taken with it. Fast forward a little and Coventry, like England, seems to have become full-on Protestant. The City was staunchly behind Parliament during the English civil war and effigies of the Pope were tied to donkeys in Godiva processions. With their faith being made “illegal”, the "idol worshipping papists" that were left within the City were very few in numbers and had to practise their faith in secret, often in the Warwickshire countryside. Following the emancipation of Catholics, the year 1843 saw the first post-reformation Catholic Church consecrated in the City, and appropriately enough it was named after Saint Osburga. With Irish people escaping the potato famine coming to Coventry and a bit later the industrialisation of Coventry attracting even greater numbers from the emerald isle, the revival of the “Old Faith” was secured. Numerous Catholic Churches and Schools were built across the City after the erection of St. Osburg's. Thankfully nowadays not many people take religion too seriously and the ones who do are not trying to impose their beliefs on others (apart from the noisy headbangers at the bottom of Hertford Street on Saturday afternoons!) Sikhs have an annual parade to celebrate the founding of their faith; a Catholic Corpus Christi procession takes place and this year the Protestants of the Orange Order had their first parade in the city for many years. A dozen or so people said the Orange Order march should have been banned, but surely if you ban one religious parade then you have to ban all of them? In a city famous for its tolerance it is only right that all faiths can express themselves. And while they are expressing themselves the rest of us can chill out and enjoy ourselves.